It's Christmas Eve and A Joyful Cottage is breaking to celebrate our Savior's birth. I thought this would be a great time to revisit Shabby Chic Retreat, the third post from the Living Large In Small Spaces series. Shabby Chic Retreat remains the most popular post not only in the series (it has received over 106,000 views), but the most popular of all my blog posts ever. I first featured Shabby Chic Retreat on October 4, 2014. If you missed it then, you're in for a treat. And for those of you who have already seen it, sit back and enjoy the tour of Tonita's fabulous space once more. There's so much to enjoy. peace among those with whom He is pleased.'" where my heart is able to sing." When I first saw Tonita's Shabby Chic Tiny Retreat it was love at first sight. If ever there was a reason for me to do cartwheels over a truly tiny house this is it. Never mind that this little cottage possesses a teapot just like mine. 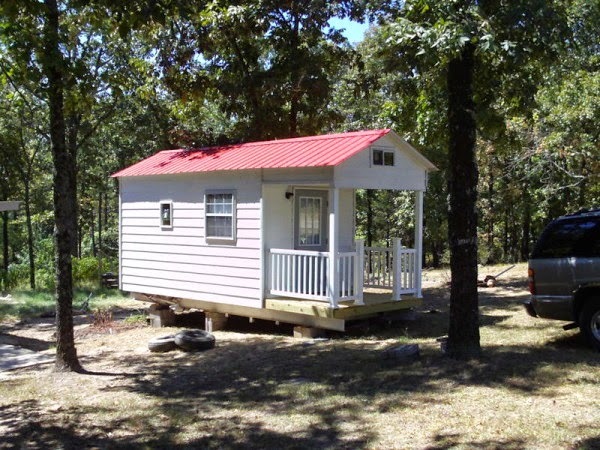 Tonita had been looking at tiny houses for years when in November 2010 she found tiny house builder Scott Stewart of Slab Town Custom Homes in Arkansas. At the time Scott was offering special pricing on The AnneMarie tiny house model. Tonita contacted Scott and after several phone conversations about customization possibilities she ordered her own tiny house. 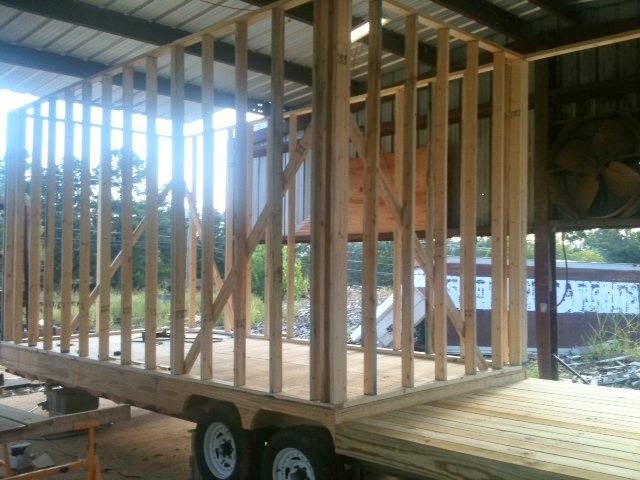 Construction of Tonita's tiny house began in October 2011.
visually apprised of his progress. Although 2,000 miles separated Tonita from her builder and house, she was involved in every aspect of the home's design and construction. "Working with an out-of-state builder is not for everyone," she says, "but with computers and phone communication it makes it easier. To maximize the bathroom's space Tonita chose a small tub with shower surround, wall sink and tankless commode. "I originally was going to use a normal home style toilet, but once it was sitting next to the bathtub it was easy to see in the pictures Scott sent me that it was just too cramped. . .I opted to use a RV low water toilet instead. It has a full flush that mimics a normal toilet." The toilet can be tied into a sewer line or a holding tank. Upper portion of the bath and shower surround. To help her visualize the home's interior while it was being built Tonita marked out an 8' x 18' area in her garage with tape. "I cut out cardboard pieces the size of my very tiny bathtub, toilet, bathroom sink, refrigerator, kitchen sink, stove top and counter space," she explains, "and placed them along the floor to mimic the layout of my tiny home." Scott left the interior wood unfinished so Tonita could paint it as she desired. The flooring is Allure Trafficmaster. By the end of November construction was complete and Scott moved Tonita's house from Mountain View, Arkansas to Springfield, Missouri. From there a friend transported the house to Tonita's land. and festive decorations were in place by Christmas. Tonita was "waiting with paint brush in hand" when her house showed up. The tiny house has a standard size front door. The house is 8' wide x 18" long and has an 8' x 6' front porch. Even with the cost to transport the finished house from Arkansas to Washington state, Tonita says her tiny house was a "great deal". Tonita stresses the importance of using a standard size front door in a tiny house. "Not so skinny people can feel uncomfortable crunching through some of the tiny front doors used on many tiny homes. This will provide your guests as well as yourself a more comfortable entry into your tiny abode. It will also allow you to move in a table that will seat up to four guests comfortably, that is if you build your home at least eight feet wide by eighteen (ish) feet long. Of course, there is always an option to purchase a table with removable legs or a fold down compact table and chairs in order to move it through a tiny door that is not a standard size. However, with tiny non-standard front doors your furniture options become a bit more limited." Filled with her vintage and shabby chic decor, Tonita's tiny house is now a romantic retreat. She jokes that the cottage has been "girly-fied". The front porch is a study in wicker and lace. In the summer Tonita's porch serves as an outdoor sitting room. Thrift store lace panels block the sun and cast fanciful patterns on the porch walls. A wicker loveseat ($25 Craigslist find) offers comfortable seating. Mismatched chairs and a wicker table keep the mood relaxed. The little table was a "free" roadside discovery that Tonita brought home and painted white. on the front door whisper "Welcome". Walking through the door of Tonita's tiny house would be like entering a fairy tale. One could imagine this as a cottage belonging to a princess. Quaint gingerbread trim and whimsical decor are found throughout the cottage. There's a sense of timelessness and enchantment in every detail. A vintage screen door was repurposed as the pantry door. Make no mistake, though. The house is equipped with modern conveniences. Built-in apartment size refrigerator with bottom freezer. Electric cook top, double sink and full size faucet. The kitchen has ample counter space for preparing meals. countertop contrasts nicely with the white cabinets. The counter does double duty as a buffet for entertaining. painted them and added glass pulls and knobs. She added the backsplash and shelves, too. A built-in shelf unit keeps things organized. Note that the front of the shelf is a ladder. The shelf unit's ladder can easily be removed and used to access the two sleeping lofts. Ladder to the guest loft. The guest loft is above the reading nook and bathroom. Tonita furnished the guest loft with a twin feather bed, which allows for extra storage room. A chandelier and fairy lights cast a dreamy glow. Ladder to the master loft. The master loft is above the front entrance. Tonita furnished the master loft with a double bed, although a queen would fit, too. The reading nook is fitted with a comfortable chaise lounge, an abundance of pillows, and a throw for curling up with a good book or settling in for a nap. Just enjoying the lovely view of Tonita's property is an option, too. The reading nook's chandelier is one of nine that hang in Tonita's tiny house. A $2 vintage medicine cabinet was repurposed as a spice cabinet. Tonita dressed up a built-in wall heater by placing a faux fireplace in front of it. The mantel was made from an old chippy door. The delightful bathroom is unabashedly frilly. One of the many lovely vignettes in the tiny house. Tonita's small space doesn't keep her from entertaining. She hosted an "I'm Dreaming of a Pink Christmas" party for four friends in her tiny house, planning ahead of time how she would accommodate winter outerwear. "A large vintage coat and hat rack inside my bath tub area held the guests' large, bulky and dripping winter coats," she explains, "while their purses sat inside my little bathtub." Tonita says her dining table seats 4 comfortably. A vintage apron adorns an old theater chair. For seating she uses old theater chairs that fold flat when not in use. Tonita's use of small scale free standing furniture instead of the hard edged built-ins typically found in today's Tiny Houses makes it comfortable, inviting and very livable. While Tonita was waiting for her tiny house to be built she repurposed an old playhouse into a chicken coop for her rare breed lavender Orpington chicks. Shabby chic chicken coop. "Why not?" Tonita quips. The coop interior includes a chandelier, washable wallpaper and chicken art on the wall. An old milk can stores organic chicken feed. "A vintage tractor seat makes a nice place for me to sit and hang out in the coop and watch my little chicks grow," Tonita explains. Tonita found old table legs ($1 each) and added them to the nesting box to give it "the look of freestanding furniture." The hens' names are painted over the nests "just in case [they]start to squabble over what space belongs to them." An enclosed chicken run -- accessed from the coop - was added later. The chickens free range when Tonita is home. Tonita stows seasonal decor and other possessions in her storage shed. "Even in a tiny house I feel it is important to be able to change out furniture and décor," she says. "I could not imagine living day in and day out, year in and year out with the same stuff in the same place all the time. I would go stir crazy and be bored to death." The 10' x 20' shed is larger than Tonita's tiny house. Used French doors found on Craig's list for $65.00. New windows with interior grids purchased at a discount contractors overstock supply - $35.00 each including screens. Faux shutters made from scrap cedar wood. Metal scroll work pieces found at a local craft shop for about $7.00 each and painted white. Vintage lace valances hung on the inside of the shed were $2.00 each at a local thrift shop. She hauled the old cedar deck section, destined for the burn pile, from her friends' old property. Metal flower boxes were purchased at Grocery outlet for $12.00 each. Road side picket fence sections complete the cottage look she wanted. "What I would like to say to people interested in downsizing or shifting to a small or tiny home is this… There are no rules to tiny or small home living. Just because you live in a tiny space you DO NOT have to be a minimalist or get rid of everything you own. I think it is important to fill your space with the things that make your heart sing, and you can have a storage unit or outbuilding to store items and then rotate them in and out with the change of your mind or the seasons. Also tiny homes may provide a mortgage free living option for you but remember they are still illegal to live in (due to size regulations) in most areas of the United States. Do your homework before you build a tiny home." Great advice from someone who's living large in a small space. Thank you, Tonita, for sharing your tiny house and Le' Chicken Chateau with us. Since this post was published, Tonita has moved from Washington state to the Appalachian Mountains where she purchased a "really old" 570 sq ft farmhouse. She blogs about her farmhouse, country life and her tiny house (which she moved with her to North Carolina) on her blog" Shabby Chic Tiny Retreat. See Scott's video tour of Tonita's completed tiny house before it left Slabtown Customs. Very informative! Tonita's little house is both amazing and beautiful! I love the shabby chic style and it doesn't overwhelm the small space at all. I'm most impressed with the kitchen...I think she could cook up a feast in there with no problem! Merry Christmas to your and yours, Nancy! Super Sweet. What a cozy little place. Merry Christmas Nancy. I do LOVE this place. I'm going to head over and see her new place next. Merry Christmas Nancy and thanks for sharing all these great places with us. OH MY GOSH! All that gingerbread trim throughout the house! Love it! So charming! What a treat! I had not seen this post before. I am in love, although I do need more space than that. I just love how she decorated it. It is truly a girly place fit for a princess! OH MY . . . oh my, oh my . . .
Merry Christmas Nancy . . . to you, your husband and loves . . . The tiny houses are quite popular now a days. They are cute but a bit too small for me. Merry Christmas to you and family! May the new year bring you peace and joy! Merry Christmas Nancy. Tonita here. So happy to see your wonderful blog back in action. I have missed reading it. And- I adore your sweet red house. SO charming. Much has changed since you first posted about my tiny retreat. I now have a new project here in the Appalachian mountains. As you know, I sold my large home in WA, bought a TINY vintage farmhouse online, sight unseen in a place I had never been or heard of. My tiny retreat was towed across America where it is parked on my land near my farmhouse. I'm drawn to tiny spaces and am blessed to have a tiny village here. A vintage glamper, a tiny house on wheels and a bit bigger more comfortable and livable farmhouse. What an adventure for me and the furkids. How fun to see the re run post of my menopause cave (tiny retreat)... Many blessings to you and yours. Thanks, Tonita! God's blessings on you, as well. The pictures are lovely, but I must say I was shocked (unpleasantly so) when I clicked through to this lady's blog and found a very negative political post. I understand that everyone is entitled to his or her opinion, and I will choose to unsubscribe. WOW. I am BLOWN AWAY!!!!!!!! As I was scrolling down reading and looking at the photos, I had to stop to go and run to see how I could get my little front door entrance chandelier all dolled up like Tonita's! IT WORKED! I had some faux greenery on hand and VOILÀ! Her tiny house décor is inspiring in me yet again, to play with the two older rooms in our home that have been deemed "mine" since we have the newer two back rooms that are for both of us. What she's done in this tiny space is possible for those of us who have small rooms but in a larger house! 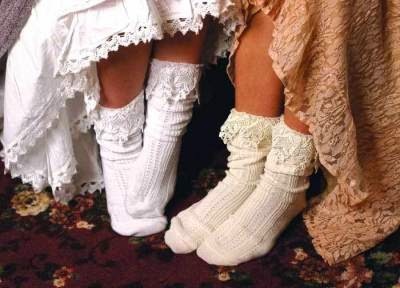 Bravo to Tonita, and thank you Nancy for coming back to Blogland! Happy 2017 my friend! WOW! No wonder this post was so popular. It really excites and inspires me. I just love what she had done with her little homestead for she and her chickens. I'm going to check out her blog next to see her new homestead. I remember this one and how beautiful Tonita's home is. Such a sweet spot. It's no wonder this post is so popular! This tiny house is fantastic. Lots of ideas that would work in an RV or in my tiny vintage trailer. Thanks for sharing it again.